A group of citizens wants to breathe new life into Trumann through the power of gardening. The Trumann Garden Guild had their first meeting last week, and their first project is to turn the old barbecue grill area behind the historic Community House into a garden. Jason Mullins, a Craighead County Master Gardener who started the group, said he'd had the idea for a gardening group for a long time. During a recent city planning meeting, he realized there were others who felt the same way and set about making the group a reality. Mullins said he had toured sites around the city and thought the Community House was the perfect place to add a garden. "The old Community House is beautiful, it's historic, there is new life coming with the fishing pond, and this will enhance it even more. It will be something for the whole community to be proud of," Mullins said. Mullins said the goal is to have a heritage garden at the Community House where people can share plants that have been handed down in the family. It will be a place where those heirloom plants can be shared with the community. Tuesday morning Mullins met with Terri Dunham, who manages the Trumann Food Pantry and works with 4-H. The two are looking into how the three organizations can work together. The Trumann Garden Guild's plan is for a garden that is not edible, but the Trumann Food Pantry started a community garden earlier this year for growing produce. Plans for that garden, located on Douglass Street on the same site the Methodist Church had their community garden, began in January with planting in April. 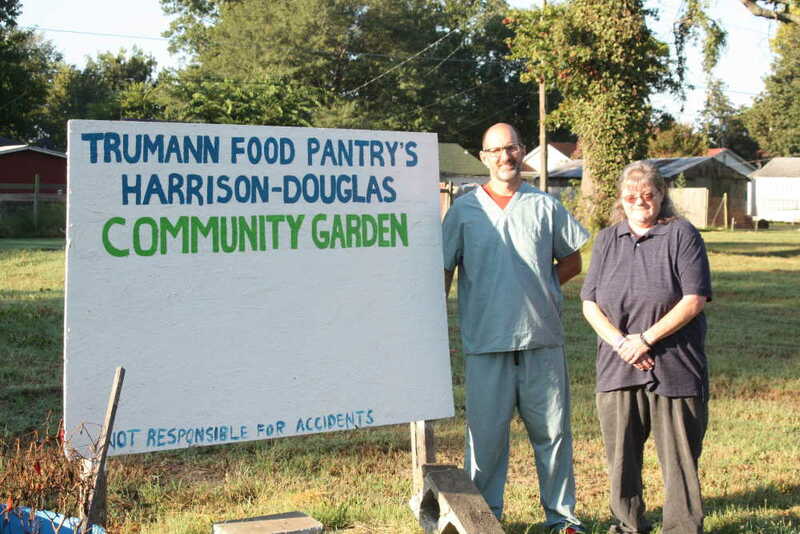 Trumann Food Pantry board member Jacob Sawyer is in charge of this garden, and Dunham said they have involvement from the community and the Extension Service. Currently, Dunham said they have applied for a Blue and You grant to fund putting in raised beds to make the community garden more accessible to the elderly and disabled. The garden grows vegetables and produce which are given out through the Trumann Food Pantry. Dunham said their future plans involve a swingset--which is being installed by the city--eventually having a children's section, a gazebo, and shed onsite. Dunham said 4-H and the Trumann Garden Guild will be involved with this garden as well. "Three organizations are willing to work together for their community," Mullins said. As far as the proposed garden at the Community House, Mullins said the Trumann Garden Guild's first meeting went well, and they have a work day scheduled for 8 a.m. on Saturday, Oct. 6, at the Community House. Volunteers will clean the site and work on preparing the beds for the garden. Mullins said they are actively recruiting, and anyone who is interested in partnering with the Trumann Garden Guild--including individuals, organizations, or businesses--can contact Mullins through the group's Facebook page or by phone at 870-974-2606. The Trumann Food Pantry can be contacted through their own Facebook page or by calling 870-273-6048.